30 Minute Sheet Pan Marinara Sauce! 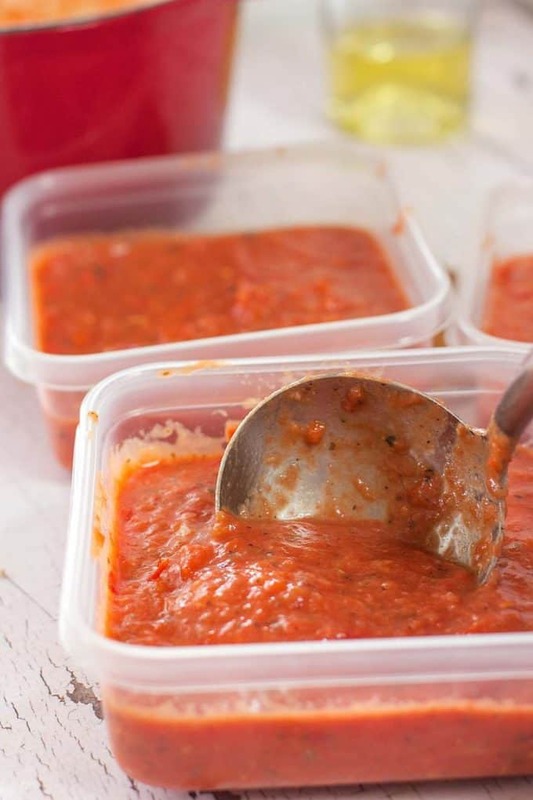 Imagine making your own fresh marinara sauce…now imagine it taking less than an hour and done on a sheet pan! It’s tomato season and I have an abundance of them! It pains me when I don’t use them up after spending months coaxing the plants to proliferate! I am no gardner. Most plants start committing slow suicide right after I bring them home. But for some reason, tomato plants like me. Could be because I water and fertilize them? I mean that could be it, right? At any rate, my two huge hybrid tomato plants are putting out the goods this year! 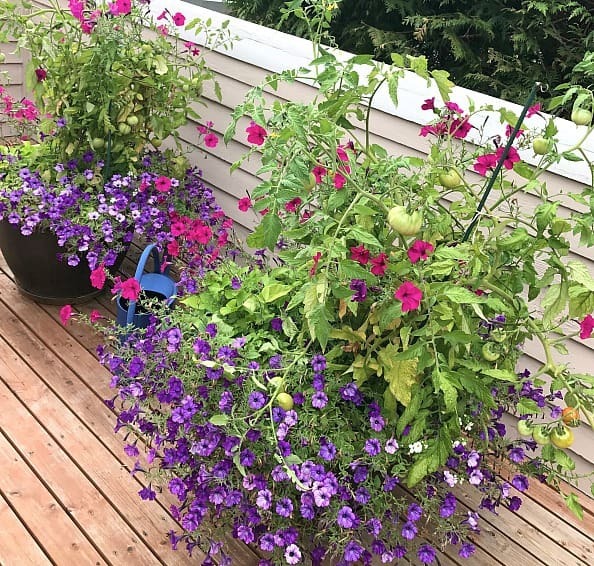 Anyone else plant flowers around their tomato plants? Last year I did Bacopa and Poblanos! Flowers and veggies seem to get along just fine. This is really more of a concept than a recipe but I’ll spell it out in the recipe card for you in case you cook like I garden :). I cut them up, tossed in a huge handful of garlic, a red pepper, some onion, salt and olive oil. I roasted everything in a 400 degree oven for about 20-25 minutes. 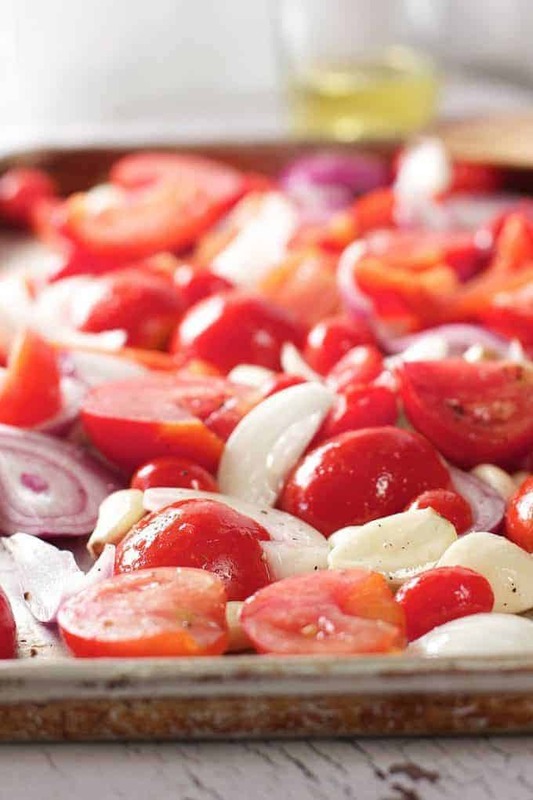 Just until the tomatoes were soft and the garlic and onion started to brown. Sometimes homegrown tomatoes have thick skin. Like me! Maybe tomatoes grow like their gardeners? The more sensitive ones, raised by sensitive people don’t have thick skin? I don’t know…but mine always have thick skin. After you roast them, you can go through and pluck off the skink if you prefer. It makes for a smoother sauce. I poured everything, including that wonderful juice in the bottom of the pan, into a pot and used my immersion blender to mix it up! (a regular blender or a food processor would work as well). I added a bit of dried basil and oregano. Tasted for more salt and added a few more teaspoons along with some fresh pepper. Poured it into a few freezer containers, and I have healthy homemade marinara whenever I want it! Hey look…I grew those and made the sauce! Who knew? Or toss in some Shrimp and Feta and make this beautiful Baked Shrimp Dish! 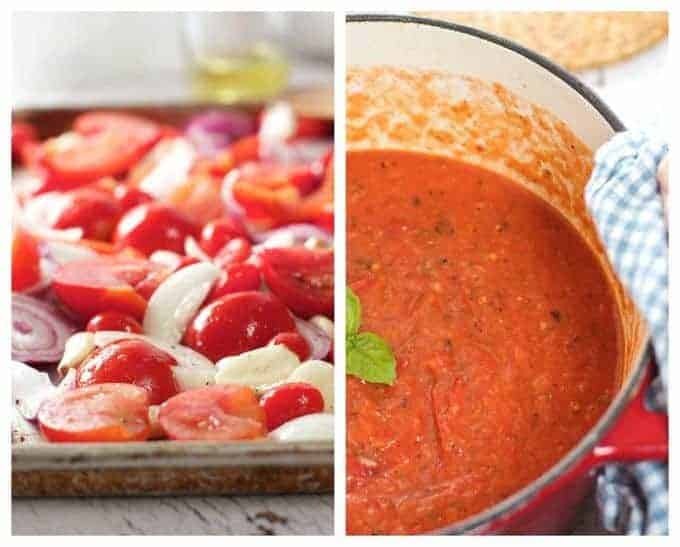 A super quick and easy homemade Marinara that comes together an a sheet pan! 3 pounds tomatoes, cored and cut in half any tomato will work! 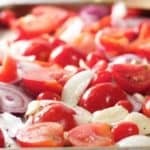 Add tomatoes, garlic, onion, red pepper to large sheeet pan. 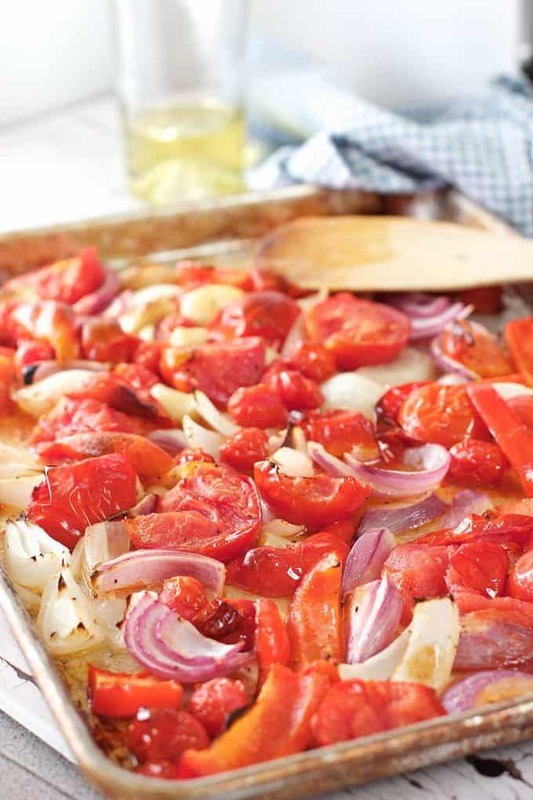 Bake for 20-25 minutes until the tomatoes are soft and the veggies are starting to brown. Let cool slightly. Remove skins of tomatoes if you prefer a smoother sauce. Pour entire mixture into either a blender, or pot and use an immersion blender. Add basil and oregano. Blend until desired consistency. Taste for seasoning. More salt? More pepper? Cool completely and pour into freezer safe containers. Pour sauce in gallon size zip lock and freeze flat in the deep freeze. After they are c=frozen they stack flat or upright depending on your freezer space. I used a similar recipe this past fall to use up my cherry tomatoes and regular tomatoes at the end of the season. Instead of oregano, I added a little dried rosemary to the sheet pan. I added the fresh basil before blending. I was eating this by the spoonful, it was so good! I cooked mine at around 350 but at 400 you would probably get a deeper roasted flavor. I highly recommend this recipe and just wish I knew how easy it was years ago. 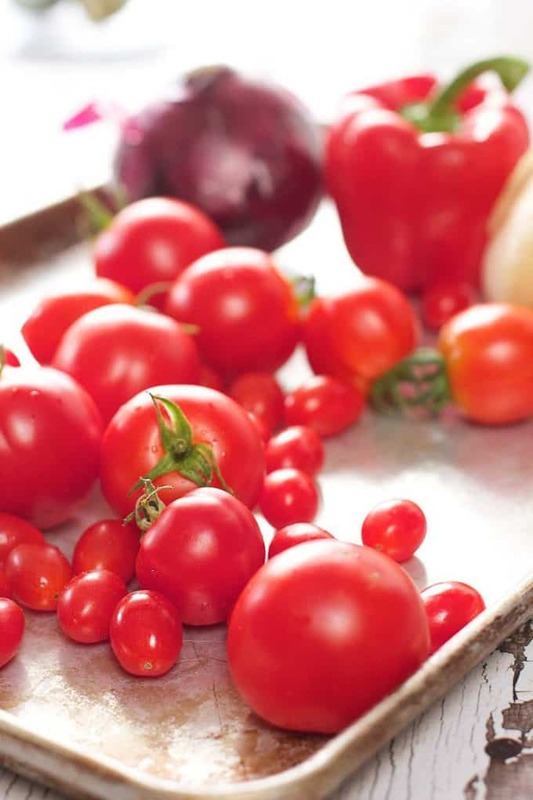 It is especially good when using those sweet cherry tomatoes that you get overwhelmed with during the growing season. 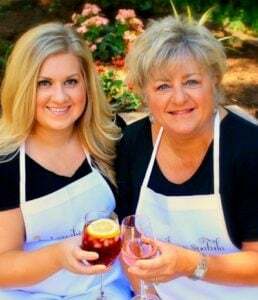 I used the orange Sungold variety with a very high brix scale so it was almost like candy!!…lol! Sheet pan Marinara Sauce??? I’ve never heard of that but it’s genius! I can’t wait to make this when it’s a bit cooler outside! Great job! Thank you Christina! I hope you get a chance to try it. I’ve got 2 containers in the freezer left that I’m gonna make soup and cream tomato sauce with! I never heard of this kind of recipe before! But it looks yummy! I am gonna make it at home. But I don’t identify what is oregano? Can you please tell me what it is. The recipe sounds good, but in the ingredients list you have “basis” instead of what I suspect should be “basil”. Thought you might like to know. Thanks Susan – my friend caught that too and I fixed it! I need an editor! LOL!